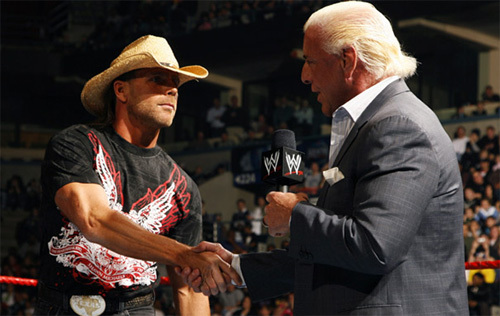 Shawn Michaels has earned the monikers "The Showstopper" and "Mr. WrestleMania" for his show-stealing performances on sports entertainments biggest stage. On March 30, Michaels will compete in his 15th WrestleMania, but this one is perhaps the most special to him. Michaels will be facing Ric Flair, the man he idolized as a youngster, in a match that very likely will be the final one of Flairs legendary career. I spoke briefly with Michaels about the match and his legacy at WrestleMania in a phone interview this afternoon. You have wrestled Ric Flair before, but can you put into words what it means to you to be facing him at WrestleMania in what could be his final match? Theres just an emotional thing here for me and for Ric that I think is probably hard for a lot of folks to get a hold of. Im going in there with a guy that, when I was 16 years old, I sat in front of the TV and I said, "Gosh, I want to be just like him. He embodies everything I want to be. Everything I picture the wrestling life to be, hes it." Fast-forward 20-some-odd years later and to be a grown man and be able to call him my friend  weve gotten so close with each other in the last several years  and then for him to handpick me to try to get him his greatest moment. I take it so seriously and so personally because of what hes meant to me in the past and what he means to me now as a friend, and what hes created in this industry. I know there are so many people that believe he ought to be honored and set apart, and to be the guy that needs to get that done, on the one hand, its wonderful. On the other hand, I go, "Gosh, I wish I wouldnt have been calling myself The Showstopper and Mr. WrestleMania all these years. Ive really worked myself into a shoot this time." Ive always gone into WrestleMania, and most of my matches and pay-per-view matches, where no matter what I was feeling on the inside  there have always been nerves and things like that  but I always went in on the outside feeling 7-feet tall and bulletproof. This is the first time that Im visibly shaken. Can I honor him? Can I do what I really believe he deserves, and can I make it happen for him? Because I want to. Theres a strange emotional thing going on for me that Ive tried to detach myself from as best I can, but its still there. Theres still a part of me thats 16. Everyone wants me to bring my best, and to do that would mean him leaving this industry forever. Being the guy that did that, and I recognize that theres a whole show that goes with that, but bittersweet is the only way that I can describe it. Theres an inner conflict going on with me the likes of which Ive never really had before because there are so many real emotional levels with me. The idea of Ric Flair not being in this industry is something that I dont even know if Im prepared for. I remember a TV match in 1991 or 92 that you had with Ric when you were still part of The Rockers. You were a young guy at that point and not yet a singles star. What was it like to work with your idol at that stage of your career? He had been in the company for a short time and that was our first chance to get to meet each other. That was when I first began to tell him sort of how I felt about him and his impact on my life. At that time I hadnt become an established anything yet other than a tag-team guy. I think it was one of those things that he had probably heard before and was flattered by. When we went out there, it was business as usual for him. Obviously, me, I was giddy, and it was the fastest eight minutes of my entire life. It wasnt that long of a match, but it was something at that point in my life that I held very precious. It was like, "Holy cow, Im in there with The Naitch. Im in there with this guy that I watched." The thing that always sort of brings me back to reality is that Ive got this buddy, Kenny, who was there with me when I was 16 years old watching Ric. And he called me way back then and said, "I cant believe you wrestled Ric Flair." And, of course, now to fast-forward so many years later, and we still talk, and hes like, "Holy cow, Shawn. Can you believe it? He might be having his last match." Theres still a part of me that I keep tucked away and hidden here in Texas thats still 16 and chatting with my buddy Kenny about the fact that Im wrestling Ric Flair at WrestleMania XXIV. I was giddy then. Now, when I talk to Kenny he gets me giddy about it. But the harsh reality is that Ric Flair has always been a part of this business for as long as I can remember. Of all the interest that Ive ever had in this line of work, hes been involved in some aspect of it. And the idea of him not being in there  I feel like the old couple that when one of them goes, the other one loses their will to live a little bit. And I really have to wonder, as goofy as it sounds, how much more Ill want to go on if hes gone.